Apple and Pinterest are teaming up to help you discover apps with a new type of pin on the social bulletin board that leads to the App Store. App pins are a type of rich pin, which offers more information than a typical pin that consists solely of an image with a link to the original source. 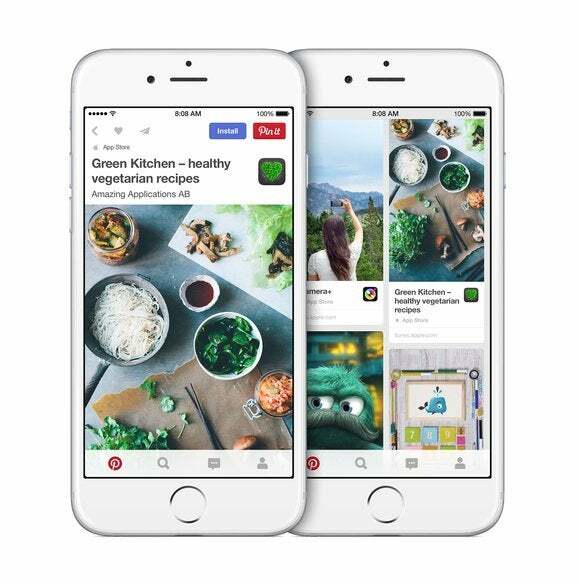 Pinterest developed rich pins two years ago and now supports detailed, contextual pins for recipes, places, articles, products, movies, and—with Apple’s help—apps. If you’re browsing Pinterest on an iOS device and come across an app pin, the platform will give you the option to install the app directly to your iPhone or iPad. To help Pinterest launch app pins, Apple has curated a collection of lifestyle apps ranging from healthy recipe services to apps for New York Fashion Week. Pinterest staffers have curated their own collection of must-have apps, complete with reasons why you need them in your life. Facebook and Twitter have also been working on the problem of app discovery, but both networks settled on app install ads that developers have to pay for. Those ads have been successful, particularly on Facebook, but Pinterest’s new app pins are more organic. You won’t see an intrusive ad for an app you’re not interested in. Instead, pins will show up in the context of your search, surrounded by related content. Why this matters: Given that more than 75 percent of Pinterest usage occurs on mobile, the new rich pins will help the network’s 70 million monthly active users—at least those using iOS—choose from the App Store’s hundreds of millions of available apps. Apple’s choice of Pinterest as its partner in app discovery is also notable, and could boost the network as it seeks to appeal to more users. And, needless to say, Android users won’t see app pins, at least not in the near future.